Notorious for its sun, beaches and mountains, Spain is the paradisiacal gem of Europe. But while many people see it as a great holiday destination, have you ever wondered what life would really be like there? With more than 70 universities, it could be the ideal place for you. 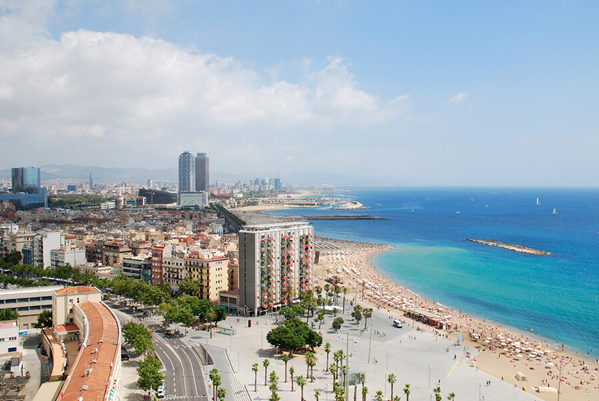 If you need help deciding, here are our 10 good reasons to study in Spain. Situated in southern Europe, Spain is a country with an endless summer and a place where people don't quite know what to do when it rains. With an average of 300 days of sunshine a year, it's the perfect place to escape from the grey skies and drizzle that plague northern countries and to soak up some vitamin D. Even though the south is considered to have the better weather, the north can be very surprising, with temperatures that never dip below ten degrees in winter. 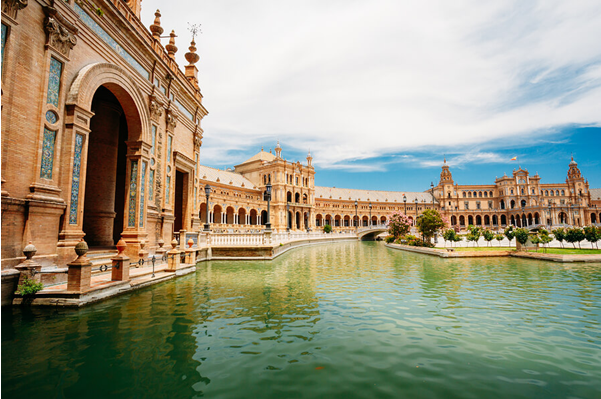 Spain is the third largest country in Europe, and while that might sound rather daunting to a prospective international student - just think about the amount of places you can visit. Whether you want to travel north to south or east to west, transport within Spain is cheap and fast. You can even try it the popular local way and car share; you'll be surprised at how many people travel here! If one country isn't enough for you, cheap airlines such as Ryanair and Vueling have cheap flights all year round to the rest of Europe, so that you can appease the travel bug inside you. If you're also looking to explore another continent, Spain is regarded as the gateway to Africa, with cheap ferries and flights leaving every day to Morocco. With miles of hot, white, sandy beaches and blue seas there's no questioning as to why many Europeans choose to spend their holidays stretched out soaking up the sun. But that's not all that Spain has to offer. From the ski slopes of the Pyrenees to the ancient, white washed villages of Granada, there's somewhere for everyone to feel at home. Rent a car and take a trip through Andalucia to experience the 'real' Spain. Football dominates the Iberian Peninsula. FC Barcelona, Real Madrid, Sevilla; the list of world-class teams goes on. La Liga, Spain's football league, even rivals that of the English Premier League and tickets to see games can be found at reasonable prices. Did you know that in 2015, the Spanish national basketball team won the European Championship? Played by both men and women, this is a hugely popular sport and if you study in Spain you'll be able to catch a great game in many cities. Life in Spain is one big fiesta; and no one throws a fiesta like the Spanish. From seeing the bulls run in Pamplona, to a city light up in flames for Las Fallas in Valencia, to throwing tomatoes in Bunol, it's a country that impresses the world. Parades, carnivals and bonfires happen throughout the year - you'll definitely get the chance to catch something if you're studying in Spain. From the Romans to the modern day, Spain's architecture is incomparable to anywhere else. Barcelona is dotted with Gaudi's famous designs, while Granada boasts the great Moorish fortress, the Alhambra. Visit a mosque from 1000 years ago one day and then the next step inside some of the most incredible cathedrals in Europe. The history of this country really comes alive in its impressive design. Madrid, Barcelona, Valencia and Seville: they're the big four and it's for a reason. Each city has its own personality and they will all entrance you with their various foods, architecture and culture. These are the most popular bucket-list cities, but don't forget about the smaller ones too. Malaga, Toledo and Santiago de Compostela are just a few more extraordinary places with intriguing traditions that shouldn't be looked over if you're planning a trip! There aren't many countries that put time aside in the day to nap, but Spain is not like many other countries. While university classes generally don't stop for the afternoon siesta, many shops and businesses do. So if you're fortunate enough to avoid having class in the afternoon, then you have full, guilt-free reign of a three hour siesta. It's the secret to anyone's heart, and Spain knows how to do it well. Picture yourself settling down after a day of lectures with your friends, drinking world class wine (affordably) and tucking into plates of tapas. If cheese, ham, bravas and tortilla doesn't sound up your street, try the nation's other favourite dish, paella. But it's not just restaurant food that will give you the best flavours. Spain produces some of the freshest, most colourful and tastiest fruit and vegetables such as tomatoes, oranges and aubergine. An estimated 559 million people speak Spanish across the world. By choosing to study in Spain, you have the chance to be a part of one of the fastest growing languages on the globe. Not only will this give you a great advantage in your future career, but you will also be able to communicate with people almost anywhere in the world - giving you a whole new outlook on travelling. Give Spanish a try and let the culture and traditions of this diverse country envelop you. The current system of education in SPAIN is known as LOE after the Ley Organica de Educacion, or Fundamental Law of Education. Education in Spain is compulsory, and free from 6 to 16 years of age, supported by the Government in each Region. There are more than 70 universities throughout Spain, around 50 are public and the rest, are private universities. They are distributed throughout the country but the biggest and most important cities have the highest number of universities, in Madrid, Barcelona and Valencia. 1. Spanish universities may be either public or private, and they can be set up under either State or Autonomous law. 2. There are at the moment 75 universities of which 50 are established on a public basis and 25 on a private basis. 3. Of the 50 public universities, 48 fall under the authority of the Autonomous Communities while fall under the Ministry of Education and Science. Spain offers a broad array of jobs for international student who wish to work while they pursue a degree in any of the country's renowned institutions. You can check your university employment helpdesk for listings of jobs. Newspapers and job portals are another great way to look for part time jobs in Spain. International students taking up part time jobs in Spain can work for 20 hours per week and earn anywhere from €7 - €10 per hour. Internships which are an integral part of the programmes are considered as future placements. What do I need to be able to study in Spain? A passport, which complies with official regulations, signed and valid for at least six months. A visa. You can apply for a student visa at the Spanish Embassy or Consulate in your country. If you want to study in an official, certified program at a Spanish university leading to a degree, you must have documentation of your academic qualifications officially recognized in Spain. These documents are not required for Spanish language and culture courses or for any program not leading to a university degree. Do I need a high level of Spanish to study at a Spanish university? Yes, in most universities you will have to take a test to confirm your linguistic ability. Universities may also consider the student's resume to verify your ability. What other requirements are needed to study at a Spanish university? If you have not studied at a university, you must submit the relevant documentation to the Ministry of Education in Spain to confirm your secondary education. All the documents that you submit must be official and issued by the appropriate authorities in accordance with the legal regulations of your country. If you are from a country which has signed the "Hague Convention", a document which has been certified with a conformant "apostille" will be accepted for legal use. If you are from a Member State of the European Union or a country which has signed the "European Economic Area Agreement", you will not be required to provide any such form. For every other country, documents must be legalized through diplomatic channels. The confirmation of these entrance requirements is carried out by the "Universidad Nacional de Educacion a Distancia", (UNED). Furthermore, if you are coming from a country which is not one of the Member States of the European Union or does not have a bilateral agreement with Spain in terms of education, you will have to pass a series of aptitude tests to be able to study at a university in Spain. These are called "Pruebas de Aptitud para el Acceso a la Universidad (PAU)" . There are specific entrance exams for foreign students, organized by the UNED. If you have already studied at a university in your own country and you wish to continue your studies in Spain, you must apply for a partial validation for the part of your degree you have taken so far. How long does the process of authorizing and validating of my studies in Spain take? Approximately three months from the time you apply to the final decision. What requirements do I need to be able to do a Masters in a Spanish university? You must have a university degree and in some cases, you will need to authorize it with the equivalent Spanish degree through the "Ministry of Science and Innovation". How long does it take to study for an Undergraduate Degree and for a Masters in Spain? It takes 4 or 5 years to study for an Undergraduate Degree and from 7 months to 2 years to study for a Masters. If I satisfy the entrance requirements for a Spanish university, can I enroll in any degree course through eduSpain? Not in all cases. Each university has its own entrance requirements and limited quotas for admissions of foreign students. However, eduSpain will help to make this procedure easier. A Degree at a public university costs, on average, 1,000 euros per academic year. A Degree at a private university costs, on average, 6,300 euros per academic year. A Masters costs from 4,000 to 30,000 euros, depending on where you study, for how long you study etc. Is it possible to get a grant for my studies? Although it is not impossible, a grant is very difficult to get. Ask eduSpain about the opportunities before you decide to start the application process. For Undergraduate program a student should have successfully completed upper secondary studies and should have a valid school leaving certificate and qualify for higher education studies in their home country, therefore also qualifying for higher education studies in Spain. For Masters' program a student should have a relevant Bachelor's or equivalent degree diploma. For a PhD program the candidate must be in possession of a relevant diploma or Master's degree program. The school you applied to will decide on the recognition on the basis of your academic background. Conditional offer letter if accepted. Complete registration and pay 1st installment and send it to the school. Complete online procedure and wait for visa approval. After visa approval book your tickets.